Capital Hospice offers a comprehensive program of care and services for patients and families in houses, apartments, nursing homes, assisted living facilities and hospitals. Capital Hospice also provides short term care within a hospice facility when the need arises. Stop by the beauty/barber salon or pub. Choose from a full daily schedule of activities from daytrips and dances to creative projects and classes. There are fitness programs for all ability levels, wellness checks, and a nurse on site 7 days a week. Opening May 2016. Visit us at our on site welcome center for more information. Haven of Northern Virginia is a non-profit, non-sectarian community organization of trained volunteers that offers emotional support to the bereaved, the seriously ill, the dying, and to their families and friends. Located on the grounds of Hope Lutheran Church at 4606 Ravensworth Road in Annandale, Haven was founded in 1976. All Haven volunteers must attend a 30 hour training program, and commit to answering telephones (2 ½ hours a week for a year). Haven activities include individual support, six week support groups and afternoon workshops. Haven has six week support groups for suicide survivors, widow/widowers, and general bereavement. Haven usually has support groups twice a year, in the Spring and in the Fall. Haven also makes community presentations and provides trained speakers for community groups, civic groups and other public and private organizations to inform them about bereavement issues, the effects of grief on employees, and other related issues. (To request a speaker, please contact Haven.) Information about issues related to grief can be found at Haven’s website, www.havenofnova.org. The website lists books related to grief and has links to articles and other websites. For additional information, please contact Haven at 703-941-7000 from 9:30 AM to 2:30 PM Monday through Friday. Or contact Haven by email at havenofnova@verizon.net. To read about the bereavement services and workshops they offer click here. Home Instead is your trusted source in helping families keep their aging grandparents, parents or friends in their home as they grow older. Home Instead provides non-medical based, home health care services to those who desire it. These senior home care services may include assistance with trips to the doctor, reminders to take the right medication at the right time, meal preparation, light housekeeping, errands, shopping and even Alzheimer's and dementia care. The result is companionship allowing seniors to feel safe and independent while they age in place in the home they've lived in for years. 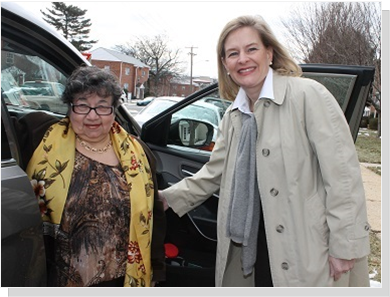 The Jewish Community Center actively administrates J Rides which provides a free volunteer driving service to non driving seniors. The Shepherd's Center provides services that assist senior adults, ages 50 and older, to live independently, and offers programs which supply opportunities for enrichment, learning, and socialization. The Shepherd's Center volunteers provide free transportation for Annandale-Springfield residents to local medical appointments. They also host bi-monthly luncheons with speakers or entertainment, Day Trips and Outings, a Lecture Series with a potpourri of speakers presenting topics as diverse as World War II to NASA, and the Raptor Conservancy to the History of the Yo-yo. They are also able to offer a Handy Helper Program where volunteers offer free labor to perform minor maintenance at your home. If you are a local senior, or if your senior relative could benefit by our services, please call today. Volunteer drivers are always needed. It’s easy! Drive only as often as you wish and when it fits your schedule. We are grateful for whatever time you can give. Just give us a call. Sleepy Hollow Healthcare Center is a senior rehabilitation center and member of the CommuniCare Family of Companies. They provide senior healthcare services such as skilled nursing, short-term recovery and rehabilitation and long-term care services focused on your emotional and physical well-being. They strive to create an excellent customer experience for each of our guests looking for skilled nursing, physical therapy, and senior rehabilitation in Annandale, Virginia. Selecting the right senior healthcare center, with the right plan of care, is crucial when it comes to meeting your healthcare needs. To deliver the very best care, they believe in an ongoing partnership with their guests and their loved ones. They involve you in every step of the planning process that is beneficial for you. This allows them to continue moving forward, together, on your path to comfort, happiness, and success. The Renaissance of Annandale is a specialty care assisted living community designed to help seniors with Alzheimer's and other types of Dementia. Our mission is to serve the greatest generation with honor, respect, faith and integrity. Our focus is to provide each resident with a "Purpose Filled Day". Our stimulating and safe environment, 24-hour nursing and personal care, innovative technology and design, embraces the needs of each individual resident. The Renaissance Team recognizes the many challenges that come with the many faces of dementia and we are here to offer a support system to our residents and their families. We are here to give families, responsible parties, loved ones and of course our residents, Peace of Mind. Washington Senior Home Care provides caregivers from many different backgrounds certified by the Commonwealth of Virginia. They are here to relieve some of the stress from the family of loved ones who are in need of assistance. Washington Senior Home Care provides services to the elderly, disabled, and other individuals that require in-home care or help with Activities of Daily Living (ADLs). They aim to make it possible for people to remain living at home. Their services are provided through private insurance, private pay, AVCC, and Medicaid. Please contact them with further questions or concerns.